Savile Row’s reputation is built upon its heritage. The recent opening up of the archives of Savile Row’s oldest surviving tailor, Henry Poole & Co, shows this. The archives, which include 130 handwritten books, detail the purchases of many high-profile customers over the street’s long history of providing suits to Europe’s wealthiest. Dating back to 1865, they are believed to be the oldest surviving records of any tailor. Included on the list is Winston Churchill, noted as having an outstanding bill. The wartime leader, according to the records, refused to pay his tab, totalling £137, after a dispute with the tailors. Luminaries recorded in the ledger include some of the most powerful and wealthy men that ruled Europe in its age of dominance, such as the 19th-century ‘Iron Chancellor’ Otto von Bismarck. All along Savile Row, the titans of the 19th and 20th centuries purchased their clothing – from world-changing politicians such as US President Harry Truman to cultural icons such as the Beatles and Mick Jagger. This history is the lifeblood of the legendary street. Savile Row’s unique heritage is drawn from the aforementioned past clients, along with a reputation for high-quality bespoke tailoring. However, increasingly, non-bespoke, more modern tailors have moved into the street and surrounding area, looking to benefit from the prestige that the name brings, without necessarily conforming to the bespoke style of tailoring that made Savile Row what it is. Along with this, feeling that they must keep up with the times, some traditional Savile Row tailors have started to look towards ready-to-wear clothing in recent years. Increasingly, it seems, Savile Row’s history and heritage is being drawn upon to sell clothes that do not represent what the street is known for. The origins of Savile Row date back to the 18th century, when tailors began to congregate around nearby Cork Street, in hope of catering to the wealthy clientele located in the area. In 1803, tailors started to move into the street itself. Soon, many of the now-famous names appeared, such as Gieves & Hawkes, Kilgour & French, Norton & Sons, Dege & Skinner, and Henry Poole & Co. Savile Row came to prominence in the mid 19th century, becoming the place where the suit itself, along with other sartorial classics such as the smoking jacket and dinner suit, was invented. Henry Poole & Co, which still has a presence on the street, is widely credited with these creations. The street became known as a place to purchase the best quality, made-to-order custom suits, most of which were handmade. 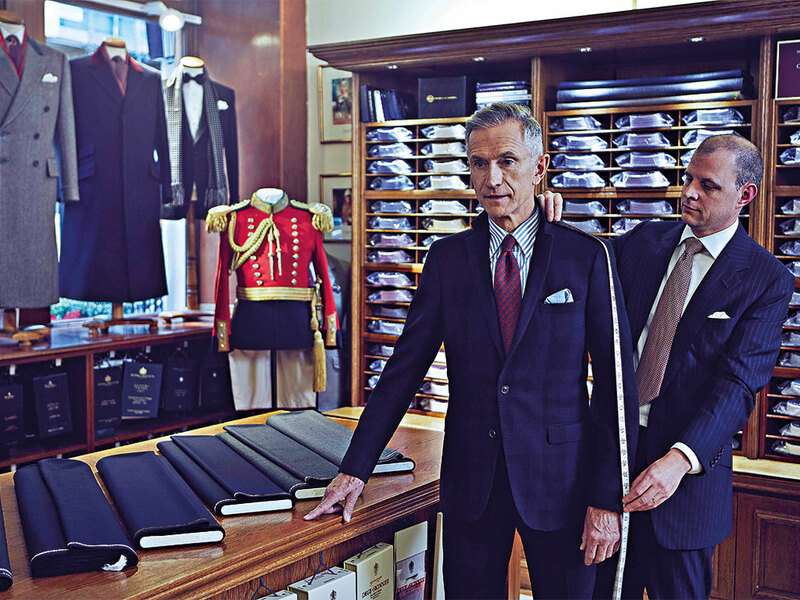 Likewise, as William Skinner, MD at Dege & Skinner, observed: “Like our one-off pieces of bespoke tailoring, each individual customer is exactly that – an individual with their own sartorial taste. Some people are drawn to our illustrious history, while others are more interested in the cloth and its provenance.” Increasingly, however, this bespoke style is seeing new, non-bespoke clothing and tailors presenting a challenge. Menswear has seen an explosion in popularity and growth in the past two decades, and is still ever on the increase. According to Quartz: “Men have been spending more on their outfits each year for well over a decade now – menswear sales, adjusted for inflation, are up 70 percent since 1998.” Male clothing was also on track to be the fastest-growing category in online retail between 2010 and 2015. This has been felt on Savile Row. In an age of growing interest in ready-to-wear fashion brands, some tailors on Savile Row have eyed an opportunity to expand beyond the bespoke, customised tailoring that used to define the street. One of the key pioneers of expanding Savile Row into ready-to-wear collections has been Carlo Brandelli. In 2003, with Brandelli as creative director, Kilgour – a 130-year-old Savile Row tailor – took a foray in this direction. Initially, the push into ready-to-wear collections was cut short by a change in ownership, resulting in Brandelli leaving the company. By 2014, however, its focus was back and so was Brandelli. Kilgour is once again selling ready-to-wear items, including through an exclusive deal with the online fashion retail giant Net-a-Porter, through its Mr Porter menswear division. However, there is a third way – many see ready-to-wear collections as complementary to traditional tailoring. Indeed, the modern trend can open up the world of bespoke tailoring to new customers. “It’s also breaking down the boundaries, as a new person buying a ten-pound pocket square can go into our haberdashery and see the bespoke clothes styled in a more relaxed way, more casually. It can dispel this slightly austere, unwelcoming, closed Savile Row world”, noted Anda Rowland, Vice Chairman of Anderson & Sheppard, in an interview with Business of Fashion. Other traditional tailors on the Row, however, are not so keen on the ready-to-wear market. Anderson told European CEO the “ready-to-wear market has got stronger” since he first started on the street in 1982. His commitment to the traditions of Savile Row is demonstrated by the fact that his company is, he noted, “possibly one of the last remaining tailors to put sleeves and shoulders in by hand”. He pointed out that the growth of ready-to-wear means that his firm must “keep a clear distance in terms of our product”. At the same time, while some big names on Savile Row are embracing ready-to-wear clothing, there is also an increasing trend of tailors renting spaces on Savile Row, yet not making the sort of bespoke suit that defined the street. Such tailors are a growing phenomenon. As Ramroop noted, one of the biggest changes he has seen over the years is a “growing number of ‘fly by night’ brands”. This dates back a number of decades, but is becoming increasingly prevalent, forcing many traditional bespoke tailors to take action. The difference is not merely academic. For many traditional Savile Row tailors, a suit is only truly a Savile Row bespoke suit if it meets a number of conditions. Firstly, it must be a unique pattern and a one-off garment. Secondly, the suit itself must be made on Savile Row. Tailors renting spaces on the street to take suit appointments, but then producing the suits elsewhere, threaten the very foundation of what Savile Row is. They are, in effect, using the name and heritage of Savile Row without embracing the very qualities that made the street what it is. With its long history, Savile Row has become synonymous with the idea of bespoke tailoring, providing clothing for the wealthiest and most powerful. Having a variety of esteemed names on its list of former customers boosts the sense of prestige that Savile Row embodies. This is part of its heritage. However, the defining feature of Savile Row – and indeed why it can boast such past patrons – is the quality and specific type of clothing it has become known to provide. The two key aspects of its heritage – the clientele it attracted and the quality of its garments – were for a long time complementary. Symbiotic, if you will. Now, however, the relationship is under threat. The two are at risk of becoming decoupled. The fear is that the heritage of Savile Row will become merely a historical reference point. It will be used as a brand name, but the defining Savile Row suit will be swamped out. The increasing prevalence of non-bespoke tailoring and ready-to-wear collections raises the prospect of such clothes, now found widely along Savile Row, merely making use of the street’s heritage as a historical curiosity and a branding tool. Yet it is the very quality of the bespoke Savile Row suit that makes the street appealing in the first place. As Bryan Manning of Manning & Manning noted in an interview: “It is the quality that creates the appeal.” While an illustrious history is nice, “if the quality wasn’t there, history alone would not keep them coming”.